Yes!! A very rare and valuable variation!! Seriously though, I have in my head that I have seen one with this dot before but I sure can't seem to recall where and I can't find one with it in past auctions. I paid less than 6 money for it so I'm hoping it comes back at least a 6. To me it is a 7 not figuring in the dot. I have a couple more Micks to pick up next weekend then I will probably send that one in next week. So I guess we'll find out in a couple of months! for once, I agree with your assessment on "centering"
That is a nice start. The 52 and 53 would complete my run nicely. I think that print mark is somewhat common where it is on the 67 Mantle? Upper right border. See post #1146. I have one without the pink dot... maybe that is the rare and valuable variation! Last edited by stlcardsfan; 03-07-2019 at 10:13 AM. Greetings. This is my first post. Great discussions on here. I have a question about what to do, or how to represent, a Mantle card with someone's initials on the back. 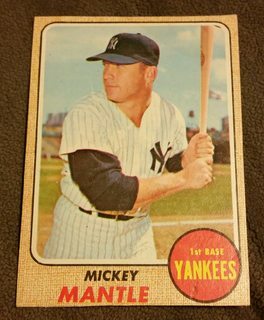 It is a 68 Mantle that the original owner I'm assuming wrote their 2-letter initials on the back of the card. It is in red felt tip, so pretty obvious. First, do initials on the BACK of the card knock it down a few grading scales? The card overall is in good shape, no creases, sharp corners, good image. Second, is it ethical to see if someone can professionally remove the initials. My goal is to understand it's worth, and then possibly sell it, depending on the outcome. Pic here: Any feedback is really appreciated. I do't like it, but will the Mantle collectors be uptight. I have seen some really poor cards sell for a lot on ebay! It depends on the condition of the front, but you aren’t getting more than “poor” pricing on a marked up, not particularly popular card. The only poor cards that bring a fortune are the rare test issues or the highly desirable rookies. Ok, so I'm possibly an idiot. I mentioned that I remember seeing one with the pink print dot but couldn't remember where. Well, it was in my own collection! Was going thru my Micks and my PSA 6 has the same dot. And here are my Mick pick ups for this week. The 69 is a little uglier than the one I bought last week and the 58 is a beater. Both were prices right. $100 for the pair. Depends on the buyer and/or the grading company. PSA would give it a MK qualifier and it would be considered 2 grades lower for registry set purposes. Maybe 2-3 grades lower on the price value. It is definitely unethical to try and remove it. Raymond, awesome Mantles you got there man. Nice. Here is a new addition to my collection. Don’t normally do SGC but this one was a very nice example. Have had all PSA 8’s and having fun finding centered high end examples in the mid grade range. Fantastic cards Keith. Well done. 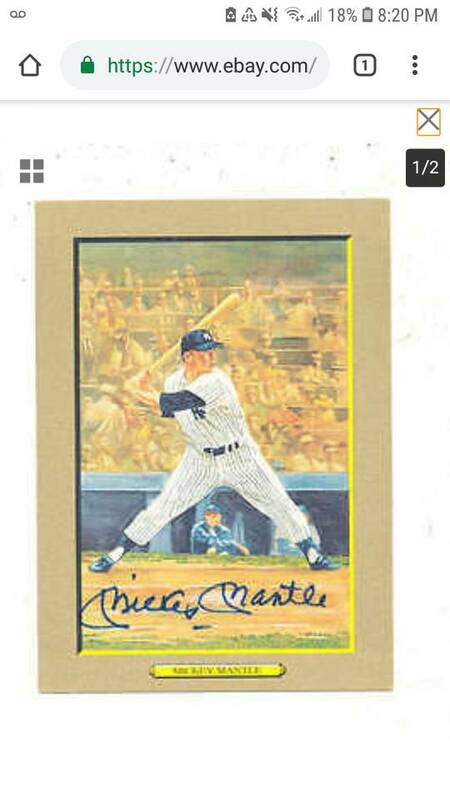 Bought a Perez Steel autographed Mickey Mantle today from Phil Regli, on ebay, not authenticated. Ebay user wwwprpsportscom. My first Mantle autograph. I know that forgeries are rampant. I also know a lot of collectors on here don't care too much for authentication, so is Phil legit enough to take his word for it? I googled him, and since he wrote for Beckett I figured it was a credible seller. It came with a small certificate of authenticity, but I had never heard of the company it came from. 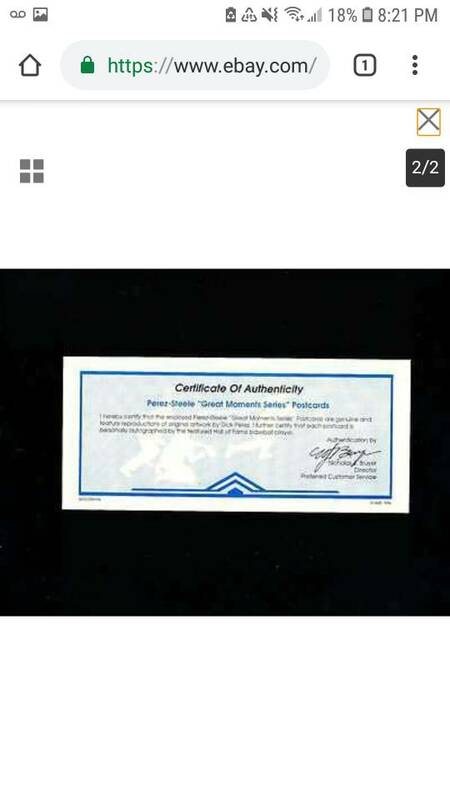 Did PS autograph cards ever come pre-authenticated? Signed by Nicholas J Thuyer. Thanks for your opinions. That SGC 7.5 is super nice. Great pickup! 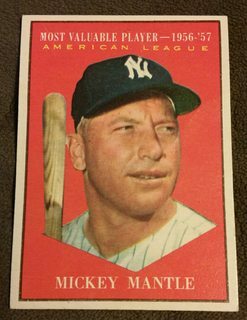 I collect 1950’s Mickey Mantle cards and the only one I was missing was the 1953 Bowman. Today, I finally got it (after selling a few cards). I couldn’t believe this PSA 1 was centered very well. Nice one Ray- was it slabbed when you bought it? Sorry about the late reply, but I somehow didn't see this until now. Carrying Tray – The plastic carrying trays that were used in the daily operations remain one of the most sought-after items from the restaurant. It features a nice black-and-white drawing of Mickey wearing his Yankees pinstriped uniform. It also has a facsimile autograph with the M.M. Country Cookin’ logo (Photo No. 118). These trays are so rare that, when available, they can command prices of more than $3,000. 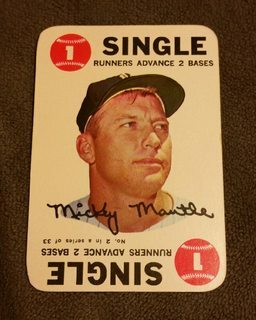 I have been collecting Mantle items for probably a little over 5 years now and have seen two on ebay in that time. One in July 2017 and one in Dec. 2018. Neither autographed. Those are the only two I've seen until the one you pictured. The prices for the two trays were just under Kelly's estimated value for the first and around half his estimated value for the second. Do you remember what they were asking for the autographed tray? Also, do you remember what they were asking for the Yoo-Hoo advertising item you have pictured? No sir- won it on the 'bay from Greg Morris...I wanted a nice raw one to go with the three I bought last week ('65,'66' & '67 - already had a '68)...and I wanted to continue to give Greg my business whenever possible after the 'solid' he did for a fellow Net54 member recently...you can find it a few pages back on the Pre-WWII section. I'm guessing this one would grade about a '6 o/c ' and I hope the others will as well once I decide to get them graded. I actually passed on one that had better centering...hoping to get this one for less than the BIN of the other one...wouldn't you know it...I paid $9 more. That will remind me not to hesitate too long on a good Mantle. Now that I double-check the 'sold' search, I see that PWCC, who I've begun to avoid because of suspicious bids, sold a '6' with no qualifiers for just a few dollars more than I paid for a clearly o/c raw. Man, that's egg on my face, for sure...what a moron! I promise to do better. Last edited by clydepepper; 03-18-2019 at 02:28 PM. 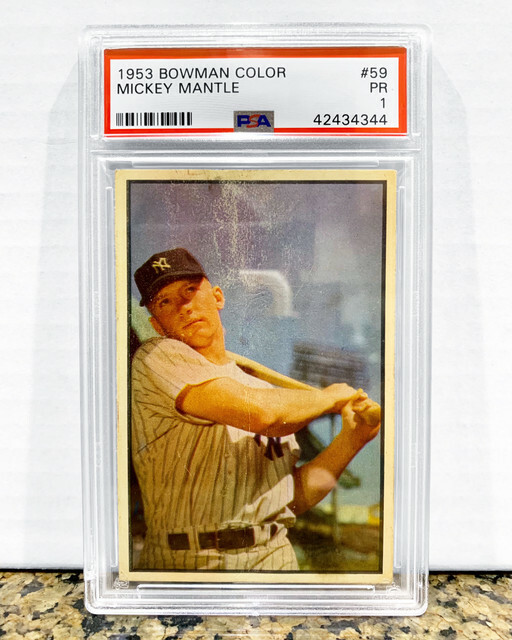 Nicely centered 53 bowman mantle psa 1. Got this 1965 one on the Net54 auctions for $100. Looks VG+ to me. Off to PSA with it. Last edited by swarmee; 03-25-2019 at 06:09 PM. Here's my latest pickup (only $33), and a good question. Why is the 1963 Post Mantle so much rarer than the 1963 Jell-O? This is the first Post that COMC has had in 10 years, compared to about 20 of the Jell-O in the same timeframe. 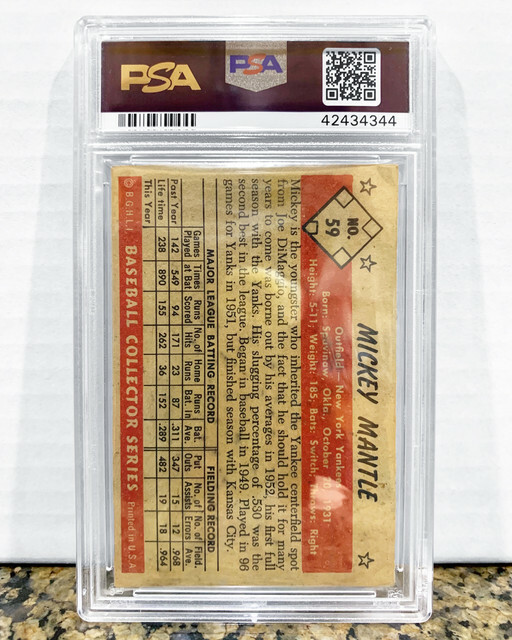 Only 6 Posts on the PSA Auction Prices Realized, and even Auth ones have sold for $267 in the past. Usually the Post cards are much more prevalent, for other players. Did Post just screw up and put The Mick on a low selling cereal or was he short-printed that year? Was there a hoarder at one time, who cleared the market in the 80s/90s? Last edited by swarmee; 03-30-2019 at 06:27 AM. Those are some super high eye appeal cards. Really well registered with clean surfaces. Can't even figure out what made the top two 5s instead of 7s. Good afternoon, John. Congratulations upon your acquiring one of the tougher Mickey Mantles. I devoted chapter 15 of my book on immediate post-war regional / food issues to this very question. Both Mantle and Roger Maris are exceedingly difficult in the 1963 Post Cereal set, whereas their respective JELL-O cards are easy-weezy. Would you care to purchase a copy of NEVER CHEAPER BY THE DOZEN to see what I had to say about it? Of course, it would cost you $30 postpaid, a mere three bucks less than you paid for your Mick. That would kinda sting. 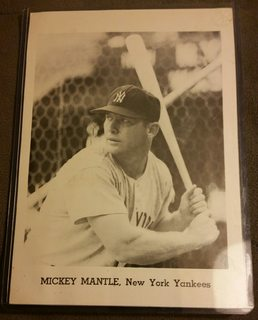 Being an honest man, I have to say your guess is correct---Mr. Mantle was printed on a very, very, very non-kid cereal. Regardless of what you decide, nice pick-up. For what it's worth, bro, when I attended the major shows I was privileged to attend from 1972 - 1977, I collected regional - food, Topps test issues, and other superstars. Mickey's beautiful 1962 Post Cereal was "all over the place"; however, his elegant 1963 Post I say a whopping one time! I failed to bag it then, as my funds were running low by the time I spotted it. I had to wait 25 long years 'til '98-'99 to win one in a Mastro Fine Sports Auction. It was a regal graded beauty, and worth the wait! Hope I didn't bore you. Have a swell day and thanks for sharing with us. Last edited by brian1961; 04-06-2019 at 12:01 AM. I figured you might know the answer. I do need to purchase your book. I'll send a PM. Love seeing all of the Mantle pickups on this thread! Picked up the blue back 52-55 Dormand Mick Bat on shoulder postcard. I knew SCD listed the blue & green variation of the 53 Dormand Mantle Bat on shoulder, but didn't realize the other differences until i had it in hand. Picked up one of the HI coasters i didn't have to add to the others. 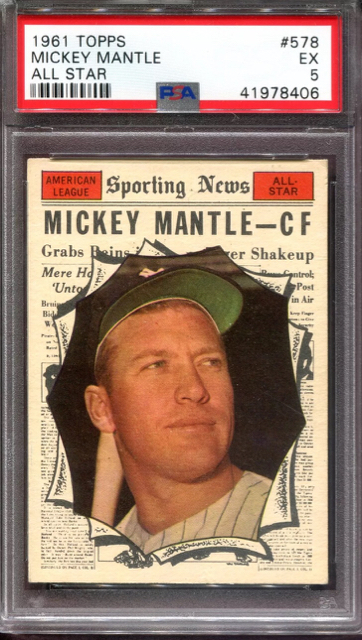 A nice 55 Exhibits PC back "Mutoscope" recently arrived from PSA And just got back a bunch of the new Jumbo slabs. Nothing Earth-shattering, but I am mostly looking for decent eye-appeal cards in mid to low grades raw. I am saving my higher grade stuff for my PC to be tucked away. There won't be any "PSA 9s" in my display, but thats by design. Ben, great stuff. Congrats! Is there a variation with the Giant and mid size or just the regular size? 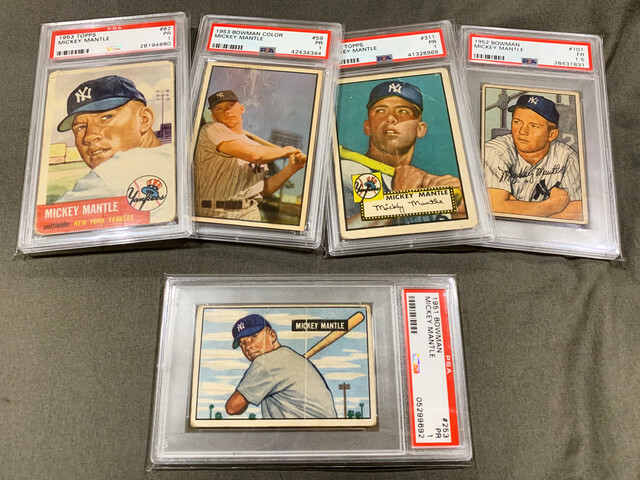 Been working for a while to try to find some centered Mantles from the 50’s and here is my collection to date. Hardest to find have been he 56 and 57, and the 58 is one of the best I have seen in any grade. Ben, as always, very interesting. Forced me to take a closer look at my small Dormund post cards. I have three of them. The top one I got first. Then later on I picked up the second one in a group lot and noticed that the color was different from the first. I didn't bother looking any closer. The card on the bottom is the one I got last. I picked it up because of the writing on the back and post mark. I see now that I have three variations of the post card. In the top card, on the back bottom left is the same marking as on the larger post cards. It has a K in a diamond to the left of the publishing information. Same number in the center back as in the larger cards. The middle one does not have the K but has the same number in the back center. The bottom one does not have the K, has a different number, and as you noticed, is blue and not green. Based on the post mark date, it is probably earlier than the others. The only difference in my largest ones is the photo is a bit (1/4") higher on one. Ha...I didn't see the K difference but luckily I have that one on my graded example! Nice catch. The color photo of my "K" PC looks washed out compared to the other two. BTW I love the written note on the PC! Awesome.